Facebook mogul Mark Zuckerberg and theoretical physicist and cosmologist Stephen Hawking have a plan to search for alien life, and it involves (crudely) using a powerful laser to shoot tiny bots into orbit around Alpha Centauri, the star system closest to our Sun. The bots would search for planets, especially habitable ones—and whatever extraterrestrial life exists upon them. 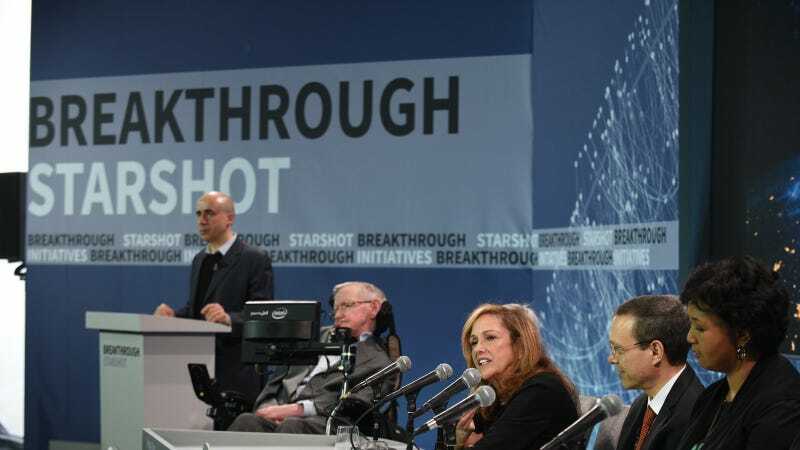 The project, called Breakthrough Starshot and announced during a press conference in New York on Tuesday, would require between $5 and $10 billion and about 44 years to execute. So far Russian billionaire Yuri Milner, who serves on the Breakthrough Starshot board of directors along with Zuckerberg and Hawking, has invested $100 million. A rocket would deliver a “mother ship” carrying a thousand or so small probes to space. Once in orbit, the probes would unfold thin sails and then, propelled by powerful laser beams from Earth, set off one by one like a flock of migrating butterflies across the universe. Within two minutes, the probes would be more than 600,000 miles from home — as far as the lasers could maintain a tight beam — and moving at a fifth of the speed of light. But it would still take 20 years for them to get to Alpha Centauri. Those that survived would zip past the star system, making measurements and beaming pictures back to Earth. The Times points out that the bots could also travel past Enceladus, a moon of Saturn that "might contain microbes — tiny forms of life." According to the Associated Press, Milner mentioned that in Tuesday's press conference that the probes will be on the lookout for possible ETs. In a statement, Hawking alluded to a need for humans to start thinking about our next move, home-planet-wise. "Earth is a wonderful place, but it might not last forever," he said, adding, “Sooner or later, we must look to the stars. Breakthrough Starshot is a very exciting first step on that journey.” Exciting, and slightly ominous. The team behind Breakthrough Starshot isn't the only one thinking about how powerful laser technology can propel probes beyond our solar system within a human's lifespan. Recently, University of California Professor Philip Lubin theorized that photonic propulsion—propulsion via a very powerful laser—could one day send a probe to Mars in as little as three days. And Bill Nye's solar sails project explores similar ideas. Milner, Hawking and Zuckerberg are joined by an impressive team of scientists and advisors, including a former director of NASA's Ames Research Center, Pete Worden. Worden seems to be approaching the project with cautious optimism. “There are about 20 key challenges we are asking the world’s scientific experts to help us with — and we are willing to financially support their work,” he told the Times. So here's your chance to help look for aliens, eccentric billionaires.